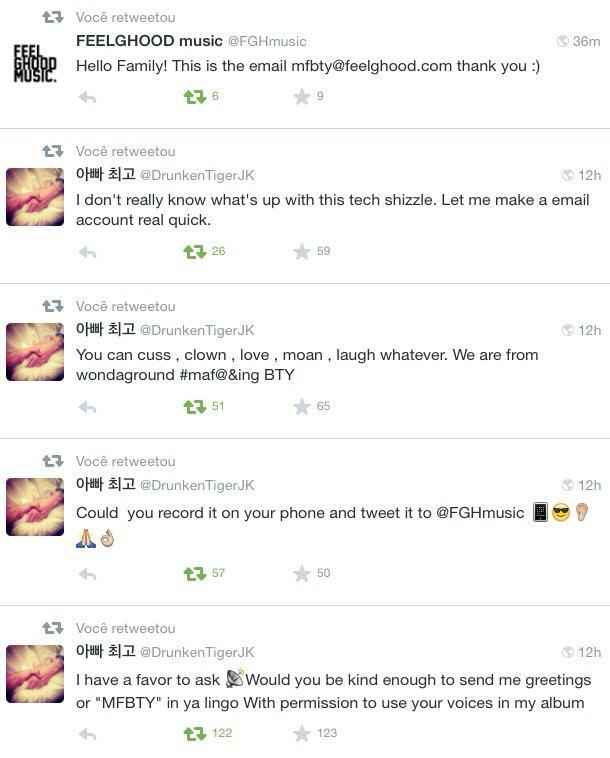 People have been trying to collaborate with Tiger JK for as long as we could remember. In an ironic twist, Tiger opened up the doors and is now asking anyone, musically inclined or not, to submit soundbites to him that he can include in what appears to be an MFBTY album. The main requirement is for the person to send a greeting or saying MFBTY in their own native tongue. Cursing, joking, laughing, and other “actions” allowed. He gave no time restraint, but we can imagine it needs to be only a few seconds (15-30 max). A phone recording is fine, but make sure you’re clearly audible. If you’d like to participate, send your soundbite to mfbty@feelghood.com asap. In a related story, videographer, Lumpenss, posted this below photo of MFBTY sitting with BTS’s, Kim Nam Joon, in the Feel Ghood Music studio. We’re not sure what it means, but we’re interested how this potential collab will work.